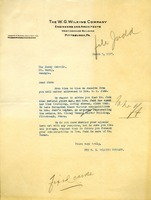 Letter to The Berry Schools from The W. G. Wilkins Company informing them that they have received matters addressed to Mrs. W. M. Judd. They informed them that Mr. Judd passed away a number of years ago and that Mrs. Judd has been traveling abroad since then. The Company have forwarded all of the addresses to the nephew of Mr. Judd because he is the attorney representing the estate. They don't know if the school's appeal has received any reply but they forwarded the addresses anyway. The Company also ask that in the future the company forward their addresses to Mrs. Judd to Mr. Tener.